Four months ago, I declared Oklahoma’s quarterback derby over. After watching Blake Bell, Kendal Thompson and Trevor Knight behind center in the Sooners’ spring game, I thought the Belldozer had sewn it up. I was far from alone in that sentiment. Bob Stoops let everyone know where they can stick those assumptions on Thursday, confirming the rumors emanating from camp this week that the upstart Knight had come out of nowhere to topple the prohibitive favorite. What did Knight do to win the job? Hell if I know. Stoops’ ship now runs tighter than Mack Brown on the second Saturday in October. OU has offered essentially zero media or fan access to his program since that Red-White Game in April. Back then I wrote that “Bell looked like the clear choice.” He seemed the most composed and confident behind the wheel. The offense just flowed better with Bell pulling the trigger. Not to mention, he had the experience that Stoops has always favored in his quarterbacks. Knight didn’t look bad, per se – he was just frenetic. Befitting a young quarterback, he came off amped up and jittery. You could see it in the way he was moving around the field just getting the signals from the sideline. Someone like me – a guy with an opinion and a laptop – would have anointed Bell QB1 right then and gone all-in in preparation for the upcoming season. Stoops and his staff kept the competition open heading into fall camp for a reason, though. 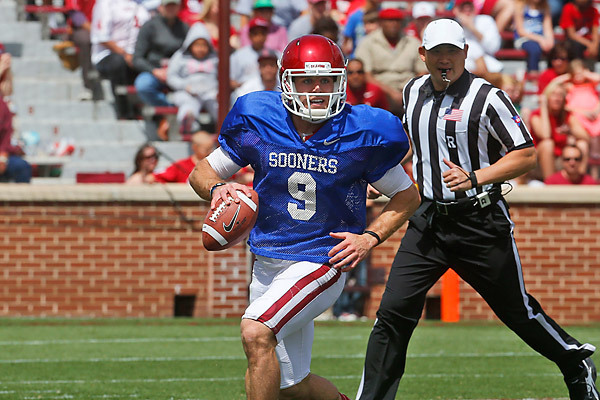 By my count, this marked the fourth offseason quarterback derby of Stoops’ tenure at Oklahoma. Each one has played out a little differently against a different backdrop. Still, in the past, the outcome tended to be the same: You could always count on the Sooners to go the safe route. In this case, it doesn’t feel like Stoops made the safe pick. Maybe that’s the sign of a desperate coach rolling the dice in hopes of rekindling the spark that turned his program into a perennial national championship contender. Going with a redshirt freshman over a touted veteran, however, suggests that this is more a case of Knight winning the job than Bell losing it. Given OU’s success at identifying and developing talent at the position under Stoops, Sooner Nation has reason to be excited about what that says about the Sooners’ new quarterback.